It is my desire that it be solemnly celebrated on the first Sunday after Easter. Our Lord has a tremendous heart. He desires intensely that we allow Him to forgive our sins. If we are separated from Him, it is not his fault but ours. Many willingly keep themselves separated from Him because they want to hold onto their own ways of doing things and their own plans and desires. Without realizing it, they miss out on so much love and so much peace. Today, we recite the Chaplet of Mercy twice: after the 9:00 AM Mass in English and at 10 AM in Polish (before the Polish Mass). This will give the most people the opportunity to participate together in this prayer of mercy. A good Confession and receiving Holy Communion today will merit complete forgiveness of your sins. Your Confession before Easter counts - as long as no serious sins were committed after that Confession. Today, is the day that two Blesseds are defined as saints. 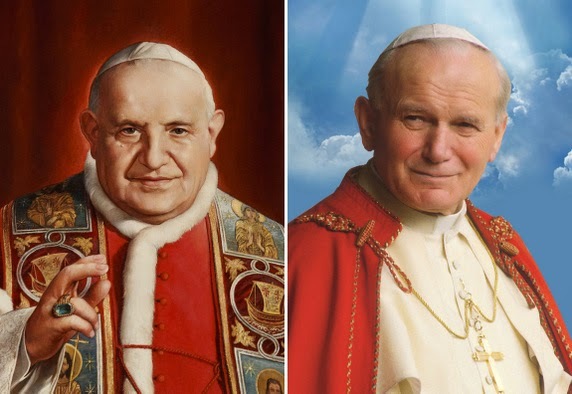 Pope John XXIII (1881 - 1963) and Pope John Paul II (1920 - 2005) are now saints. Title "Saint" is a declaration that the particular soul in heaven is recommended as an example for us to imitate. Pope St. John XXIII's motto was "Obedience and Peace." During World War II, while he was the Apostolic Delegate to Turkey, he was instrumental in saving the lives of an estimated 24,000 Jews by issuing them transit visas. * from the homily of Pope Emeritus Benedict XVI during the beatification Mass of Pope John Paul II, May 1, 2011.